Hire better candidates faster with structured behavioral interviews. 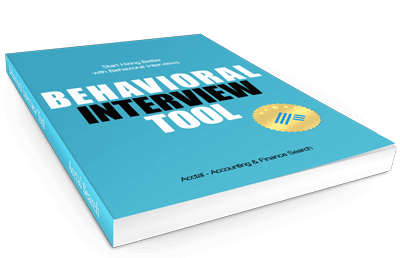 If you are a CFO, Controller, VP Finance, or Accounting/Finance Manager aiming to hire world class talent, achieving your goal starts with conducting structured behavioral interviews. Covering all the questions you need to ask at every stage of the interview, our new Behavioral Interview Tool offers a step-by-step guide to conducting the perfect job interview every time. Get started today. Download this free tool and share it with your team. Acctal is committed to helping you through every stage of your hiring process by offering even more free hiring tools.